Queen’s University Belfast will be the first university in the UK to use a new birthing simulator that can laugh, cry and bleed to train midwives through the pregnancy process from scan to birth. 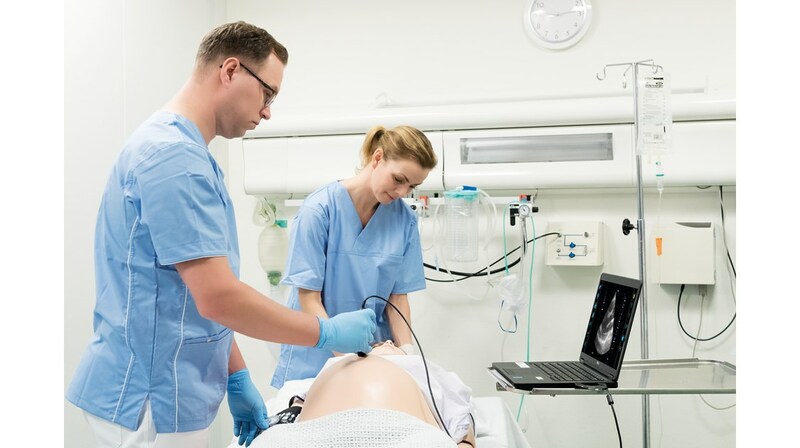 The University will launch the simulator later today (Wednesday 13 September), in one of its state-of-the-art simulation suites, when midwives and a number of students will be invited to test the equipment. The birthing simulator – known as SonoSim – presents like a real pregnant mother complete with internal organs. The mannequin can be linked to a scanner that is programmed with a choice of hundreds of scans representing scenarios that a pregnant mother and her baby may face from early stages of pregnancy right through to birth. Students will be presented with a number of real-life situations. The mannequin will be linked to a scanner, enabling students to date the birth in the early stages of pregnancy right through to detecting a number of foetal abnormalities at the 20 week scan. The mannequin will also mimic the birthing process, presenting a number of labour-related scenarios that midwives may deal with such as a postpartum haemorrhage before a mannequin baby is ‘born’. Professor Fitzsimons added: “Until now, trainee midwives would learn about pregnancy scans through shadowing an experienced midwife in a hospital. This equipment will better prepare our students for this experience and facilitate assessment through a one-way mirror in our state-of-the-art birthing suites. “This real-life environment complete with a human-like mannequin that can laugh, cry and bleed creates a cutting-edge learning experience.